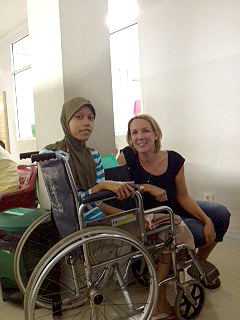 Last week MCK volunteer Sarah introduced Asli to Cipto Hospital. Asli came to know of MCK through Scott’s amazing Running Bali to Jakarta campaign and wanted to see for herself how the donations that are being made to MCK are used. We started our visit at the ever busy polyclinic – or outpatients department. The polyclinic sees over 70 children a day and is always overcrowded. It is heartbreaking to see the children suffering as they wait for their consultations, yet it is good to know that these children are receiving solid medical care. So many families in Indonesia avoid hospitals for reasons of fear or finance, and often they come too late. One of the patients waiting for the results of blood tests was Nani, our 14 year old friend who had her leg removed earlier this year due to cancer. Nani is now waiting for her third round of chemotherapy and up until now things seemed to be going great, however her body is taking longer to recover from the previous chemotherapy. Nani is receiving blood tests every day until the results show that she is ready for her next round of treatment. Because of the daily visits, Nani is staying at the wonderful Rumah Kita II house nearby – a homestay for children and a family member who either cannot withstand the travelling to and from the hospital or who simply cannot afford it. Nani was accompanied by her mum and was in good spirits today, despite her poorly condition. Keep strong Nani, and keep fighting. After the polyclinic we paid a quick visit to the ER department to see some of Dr Endang and Dr Karyanti’s patients who do not yet have beds on the main wards. The ER was very busy and as such spent a few short minutes talking to the doctor on call. He seemed worried about a young child with dengue fever who had arrived that day. On the neo-natal ward Dr Rina escorted Asli and Sarah to meet some of the babies that are being helped by MCK. Dr Rina explained the Jamkesdal system of insurance which is a fairly new initiative. The Indonesian government now pays for all women to have their babies at a hospital, if they so wish, and will cover the first 28 days of medical costs if needed. This has taken quite a strain off the neo-natal department and has meant that MCK spending is now being directed to babies with more long-term illnesses. We visited again with the last set of conjoined twins at the hospital, two boys joined at the waist down. The doctors were due to meet the next day to discuss whether or not separation is viable. To all the children and babies, we wish you all much love and luck on your road to recovery.